Do you know the difference between low blood sugar and dehydration symptoms? Here are some similarities and differences. Once you know what the cause of the symptom is, then you can know how to fix it – this is what I do with clients is help them know what those symptoms are and why they are happening. Then we create a plan to correct the issue once we know in this case whether it is caused by low blood sugar or dehydration. Shakiness – This is low blood sugar but does not typically happen with dehydration. Rapid heart rate – I have not witnessed this as a low blood sugar issues, but if both list it, it must be a symptom! In dehydration, the heart beat will also climb and be jumpy in the higher ranges. This erratic and high heart rate is a sure sign of dehydration. Fatigue – This is a symptom of both. With low blood sugar, you typically crave caffeine and need a boost of energy. But caffeine is not the solution, it can actually be dangerous in some cases. If you check the time since your last meal, it may be a clear indication you need to just eat, not grab a cup of coffee. In dehydration, you feel like the wind got knocked out of your sails and you can no longer go at the same pace. It is usually matched with despondency and the desire to go lie down under a tree in the shade and sleep. 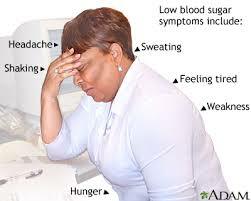 Impatience and irritability – This is definitely a low blood sugar issue and not a dehydration symptom. Notice how co-workers typically get irritable and short with you late morning- they ate breakfast at 6:30/7 AM and by 11 they get very moody. Yes, they need to eat! Although drinking water might also be a good healthy idea, too. Headache – This a symptom of both. But you want to pair this up with any of the other symptoms to know which it is. Usually a dehydration headache is coupled with fatigue, despondency and slight nausea. Low blood sugar will be coupled with lack of ability to think and put sentences together well, and fatigue often with the desire for caffeine. There are a few more symptoms of each but these are the main differences and similarities between low blood sugar and dehydration. Low blood sugar can be corrected with eating regularly spaced meals which are Metabolically Efficient™ and balanced with protein, vegetables, healthy fats and some carbohydrates. Eating approximately every 3-4 hours also helps rather than every 5-6 hours. Dehydration can be corrected with electrolyte supplementation such as Endurolyte capsules or a sports drink like Infinit Nutrition. (use nutritioninmotion for 10% discount) You may also need to include food which are rich in calcium, magnesium and potassium not just sodium. If you need help with differentiating between you symptoms to know what is truly the cause, feel free to leave a comment below or contact me to schedule a 30-minute nutrition review to get to the cause. Then we can create the correct nutrition plan to correct the issue. If you have a serious health issue, it is time to schedule time at the ER or with your doctor or specialist. I feel very dehydrated, but dont feel thirsty, no energy to workout, cold feet, low libido, not feel hungry, cant think properly, i dont get pump while working out, thinning hair, gaining weight and it gets worse while sweat! These are my symptoms. Any advice will be appreciated. This sounds to me like a combination of dehydration potentially from low electrokytes, and a bit of adrenal fatigue which may also be causing the low libido and hair falling out – I had those symptoms too when I had adrenal exhaustion. Then I may be able to give you better advice based on what would work best for you. Typically cold hands and cold feet do indicate low electrolyte dehydration…which can be a symptom caused by low adrenal function. Good info and very help full but I still wold like to know how to know if it’s dehydration or low blood sugar when I feel desprate symptoms like almost similar to an anxiety attack. Thanks…. Thanks Sergio for reading and posting your comment. Stress and anxiety typically diminish digestion of nutrients but can also deplete electrolytes like magnesium and sodium (teh adrenal response). I would first suggest to do some deep breathing to help lower some of the anxiety. But eating probably will be futile and may cause other digestive upset. A small glass of apple cider may do the trick though and if you do feel better in a few minutes, then you have a confirmation that low blood sugar is contributing to the issue. When I say a small glass, I mean 4-6 ounces of apple cider, not apple juice. That typically gets into the blood stream fairly quickly. And epsom salt bath may be the fastest way to increase magnesium into the body – it can be absorbed via the skin but then you may not be close to a bathtub when in such situations. There is a powdered supplement called Calm by Natural Vitality which is an effervescent magnesium citrate. My caution here is that it can calm you pretty quickly but if you take too much, you may get very sleepy and/or you can get some very loose stools (citrate form of magnesium has that effect). You may consider essential oils, too to help with calming. I would recommend to start with lavender, or maybe Serenity or Balance blends. go to http://www.mydoterra.com/joannachodorowska and check them out. You will want to use therapeutic oils only. But these are known to calm anxiety and I have had some use the lavender with the Balance blend either aromatically in a diffuser, or apply a drop of each onto their feet bottoms or on wrists.